East Texas and North Louisiana | EXCO Resources, Inc. Prior to drilling, we consult with landowners to select an appropriate drill site which is typically close in proximity to existing roads and other infrastructure while avoiding wetland areas. Our drilling pads are constructed using a soil-cement technique, which helps direct and prevent drainage from potential spills on the location. In addition, we have drilled wells in Texas and Louisiana using multi-well horizontal pad drilling techniques that permit us to tap large reservoir areas from a small surface location. Multi-well pad drilling allows us to reach out more than a mile in each direction without disturbing as much surface. Using this technique, we have drilled up to four wells from a single eight acre drill pad, significantly reducing the surface disruption from our natural gas operations. As many as 520 acres of shale reservoir can be tapped from this single eight acre drill pad. We take great care in the design and construction of the protective casing used in our wells. Our casing designs are reviewed and approved by independent third-party engineering firms prior to implementation. We recognize the risk of contamination to potable water sources that can arise from faulty or defective casing. To protect against this risk, we currently set an additional casing string in all our Louisiana shale wells across potable water sources resulting in four protective layers of cement and steel. We also pressure test wells prior to our fracture stimulation operations and apply advanced acoustic testing methods to ensure the integrity of our casing. Properly cementing and casing a well and verifying its mechanical integrity prior to conducting fracture stimulation operations is critical to preventing gas migration. Casing pressure tests detect deficiencies before a well could create a potential safety or environmental problem. We remotely monitor the drilling, completion process and production from our wells in real-time from our state of the art control room. Remote monitoring allows our teams to communicate with our on-site personnel to make real-time adjustments to our drilling, completion, or production processes and to remotely control gas flow rates on some of our existing shale wells. A substantial amount of water is required to drill and complete a well in the Haynesville and Bossier shales. We recognized the need to find alternative water supplies early on in the development of our core Haynesville shale assets in DeSoto Parish, Louisiana. As a result, we entered into an agreement to source a substantial portion of our water needs for hydraulic fracturing activities from a local paper plant’s discharge water, which greatly lessens the demand on local surface and groundwater resources. Approximately 50% of the water we currently use to hydraulically fracture our shale properties in Louisiana consists of this discharge water and the remaining portion is obtained from local surface water sources. This discharged water is transported to our drilling location using a network of pipelines, reducing the need to transport the water in trucks. All of the water we currently use to hydraulically fracture our shale properties in East Texas consists of a lower quality, brackish water that is located in a deeper horizon than preferred potable water sources. 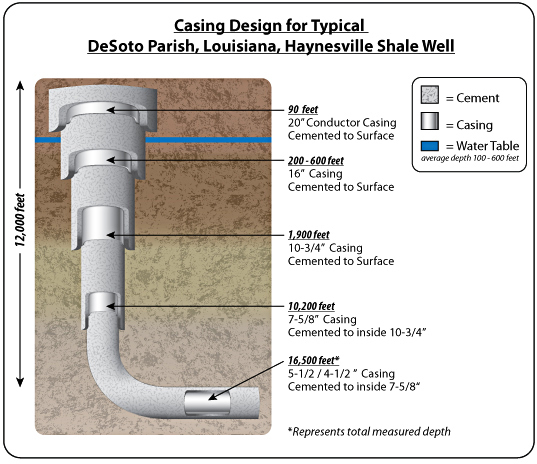 Based on current completion techniques, a typical fracturing procedure for a well in the Haynesville and Bossier shale formations in East Texas/North Louisiana ranges from 11 to 14 stages and uses approximately 300,000 to 600,000 gallons of fluid per stage (90% of the gallons are water and approximately 9.5% of the gallons-equivalent are sand or other specially engineered proppant). Approximately 0.5% of fracturing fluid is composed of gelling agents and other chemicals depicted below which are publicly disclosed on a well by well basis on the website www.fracfocus.org. EXCO was an early adopter in Louisiana and Texas of the website www.fracfocus.org and has disclosed on that website all chemical additives used in its stimulation fluid on a well by well basis since June 2011. The website www.fracfocus.org is a joint registry created by the Ground Water Protection Council and the Interstate Oil and Gas Compact Commission. All produced water from our Haynesville and Bossier shale wells in East Texas and North Louisiana is stored in tanks and then transported to authorized disposal facilities. We audit these disposal facilities to ensure proper handling of the produced water. We also retained a third party environmental consulting company to assess current waste management practices in Texas and Louisiana operations and create a comprehensive waste management program for use across the area. The program design focuses on limiting regulatory liability and reduction of waste-related expenditures by establishing uniform waste management and minimization practices. EXCO will utilize a tiered approach in waste management planning which focuses on multiple areas including uniformity, source reduction, reutilization, reclamation, personnel training, and contractor management. EXCO has completed the field assessment phase of the program development. We are committed to reducing air emissions throughout our operations. We have successfully eliminated much of the higher carbon producing diesel fuel emissions by converting some of our drilling rigs in East Texas and North Louisiana to bi-fuel rigs that are powered by natural gas and diesel, with some using up to 65% natural gas. We have also converted a substantial portion of our trucks to run on compressed natural gas (CNG) in areas where our operations are geographically concentrated. Reducing air emissions by decreasing truck traffic is another EXCO priority. For example, we transport discharge water from a local paper plant in DeSoto Parish, Louisiana to our drilling and completion locations using a pipeline instead of trucks. In addition, the produced water from many of our Cotton Valley wells is transported using a salt water disposal pipeline instead of trucks. We also routinely use solar powered injection pumps as opposed to natural gas powered pumps that vent natural gas. As is customary in our industry, we use outside contractors to perform drilling and hydraulic fracturing operations on our behalf. We rigorously review the qualifications, including environmental, health and safety records, of these contractors as part of our contractor selection process. In addition, a representative employed by EXCO’s Environmental, Health and Safety department monitors every EXCO drilling and completion location. We retain in-house and independent third-party inspectors to monitor operations on our drill sites. We believe that education of citizens in local communities about oil and natural gas operations is vital to reducing the impact of potential incidents. In East Texas and North Louisiana, we work closely with the Smalley Foundation to help sponsor educational programs in local schools about the hazards of oil and natural gas drilling sites. The program is intended to educate and train first responders and schools should there be an emergency such as uncontrolled wellhead releases or chemical fires on or around a drilling location. In 2010, we commissioned an independent social impact assessment of our on-going operations in DeSoto Parish, Louisiana to help inform us about local community concerns so those matters can be incorporated into our development plans and operations where practical. We also maintain a hotline at (888) 788-3781 for anyone in any of our operating areas to report their concerns to us.